Always a fan of virtuosity, here is a burning, liquid line from guitarist Neil Degraide off the new album, The Raven Locks -Act 2 by Dirt Poor Robins. Its in the intro to the track, Maximilian Von Spee (more on Dirt Poor Robins below). Check the line out. Listen to it here (right at the beginning). Its a Cm lick that fits well in the standard pentatonic shape (G shape for you CAGED people) and uses a good deal of legato, slurs, hammer-ons and pull-offs, etc. Its great practice and has a cool major/minor pentatonic bluesy sound. This line flows really nicely under your fingers. It mixes picking with your middle finger, a downstroke with your pick, and a backwards sweep. Go slowly and eventually it will sit really nicely and fluidly. In fact, this line works well on its own. Try moving it up and down the neck as it sounds impressive and is worth working out. This is similar to part 1 but a little shorter. Start with the middle finger and move into a backwards sweep. Again, a nice fast, fluid motion. Once you're comfortable with it, try putting parts 1 and 2 together. Just those two parts will sound impressive on their own. Then add the final section. Again, start with the middle finger, go into a backwards sweep and slide down to the final note. 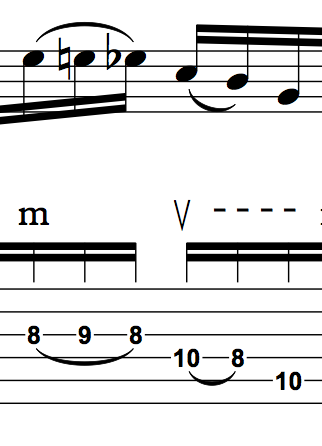 This part you could finger differently if you don't like the sweep, but try it out. The difficulty in this section is the move from the 4th string to the 5th string. You have to prep a little bar before you move to the 5th string. Experiment with what works for you. You could break it up or finger it differently (it could work nicely with just fingers too), but hopefully this helps. Often we try and attack an idea we want to learn but bite off too much at first, get frustrated, and stop. Going slowly and breaking it up into smaller components can really help. And, as with any idea, move it around the neck, take bits and pieces of it and experiment with variations. Make it your own. Also, if you don't already know of the Dirt Poor Robins, as a music lover you owe it to yourself to check them out. Even if its not your go-to style they are wildly creative, great musicians, and absolutely worth your time. There is plenty more great guitar playing to be heard too. Check them out here. Have fun with the line and keep practicing!